Part of the McIntosh Group of high-end audio brands, Italian manufacturer Sonus faber has a history of developing premium speakers well known for their beautiful wood work, elegant designs, and sophisticated sonics. And last week, High-Def Digest was invited to attend a special demo of the company's latest flagship speaker model: the all-new and improved Aida floor-standing loudspeaker. 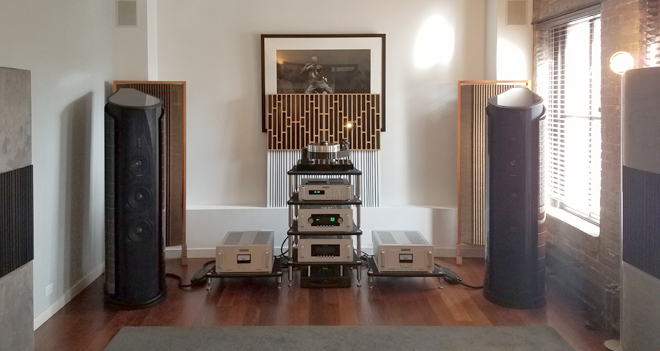 Held at the historic 5-story World of McIntosh Townhouse in New York City, the event allowed us to get up close and personal with the premium speakers while enjoying an intimate listening session fueled by an eclectic assortment of music selections. Serving as a successor to the previously released 2011 model, the new Aida features the same elegant aesthetic as its predecessor along with a completely overhauled internal design, blending gorgeous looks with improved drivers to deliver a truly premium product for an equally premium MSRP of $130,000 per pair. When it comes to looks, the new Aida "3 and 2/3 way" floor-standing loudspeaker is essentially the same as the previous edition, though there is a new Wenge wood finish option treated with maple wood inlay and the company's signature hand polishing process. The cabinet uses the same "lyra shape" design as before with dual-side curvature and special cross grained Okoumè plywood in a double thickness constriction layer damped configuration. The result? One very handsome yet very large speaker that should have no problem complementing a customer's high-end furniture set -- so long as you have enough room to fit it. Each unit measures 68"’x 19"’ x 31" and weighs in at about 364 pounds. Beyond general aesthetics, the cabinet features the company's "Anima Legata" system, "Tuned Mass Dampers," and "Bow suspension" with a "Zero Vibration Transmission" system. 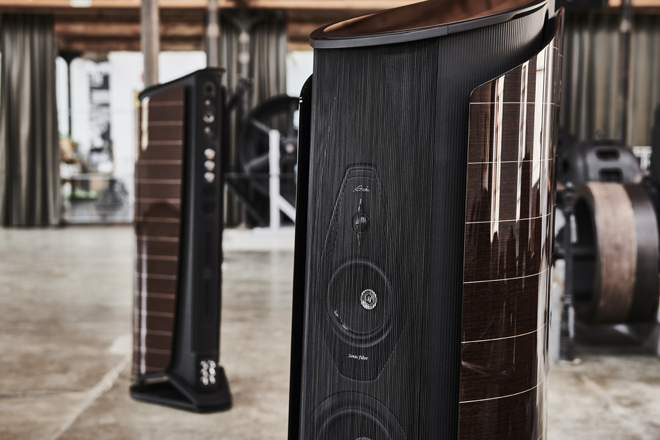 Put together, these design features basically all help to minimize unwanted resonance and vibration in the loudspeaker and the surrounding musical environment, helping the Aida to not only create quality sound but also a correct reproduction of silence, which Sonus faber calls "the canvas where music is painted." Meanwhile, when it comes to bass performance, the speaker utilizes the company's patented Stealth Ultraflex system. This tech enables superior bass extension in low frequencies compared to a traditional ported system while also minimizing THD (total harmonic distortion). Under the hood, the updated Aida features a completely new driver system, including a "D.A.D. Arrow Point" H28 XTR-04 tweeter and an M18 XTR-04 midrange enhanced with an avional-gunmetal basket. Together, the tweeter and midrange help to produce the "Voice of Sonus faber," which the company defines as its trademark warm and involving timbre. And to complete the driver array, the system also houses a W22 XTR-12 woofer with all-new Neodymium magnet motors and a SW32 XTR-08 infra-woofer with a Nano Carbon sandwich cone and long-throw 4’" voice-coils powered by a Neodymium magnet motor. Finally, the speaker includes Sound Field Shaper technology with an array of rear-facing drivers. This feature actually allows a user to adjust the depth of the soundstage through control of the speaker's direct/reverberant radiation ratio to suit one's desired preferences for a specific room. Of course, all the above technical jargon is meaningless if it doesn't translate into impressive real-world performance. And with that in mind, we actually got to put all those fancy specs to the test with a half-hour listening session. 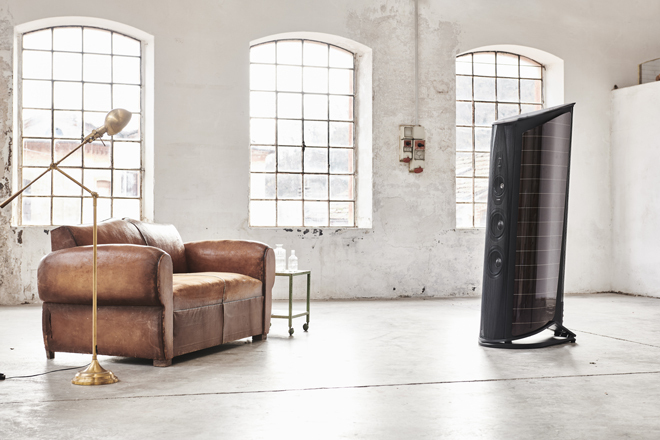 To demo the Aida speakers, Sonus faber escorted a small group of journalists and dealers into a cozy listening room located on one of the townhouse's upper levels. Powered by an Audio Research amp, the demonstration featured several CD tracks being played off of an Audio Research CD player. Kicking things off right, we listened to "Walking on the Moon" by the Yuri Honing Trio. The dynamic jazz piece proved to be a great introduction to the Aida's impressive tonal depth, range, and texture. Strumming bass notes carried a pleasing resonance, the moaning saxophone was nice and smooth, and the drum beat remained distinct and clean throughout. The track takes its time building to a robust middle section before gently petering off again, and the speakers really came alive during the vibrant halfway stretch, making it feel as if we were right there with the instruments during the recording session. Introducing vocals to the mix, the next track we demoed was Doug MacLeod's "Black Nights." The speakers produced a full and intimate soundstage marked by a wide sense of height and separation between the instruments and vocals, giving MacLeod's melancholy blues lyrics a spacious atmosphere. As a counterpoint, the next song, "Lester's Methadone Clinic" by Sonia Dada, perked things up considerably, spreading a funky and energetic R&B tune around the room. Filled with lively snaps, claps, gliding piano keys, and warm vocals, the song played through the speakers with a great sense of stereo imaging and overall fidelity, realizing all of the track's many layered tones with a precise yet very cohesive sound. Finally, to close out the demo we listened to "Le Temps Passe" by Michel Jonasz. The French track provided a powerful finale that left us wanting more -- even after its 11-minute runtime. With a steady, slow bass rhythm layered under deep, warm vocals, the song carried an almost haunting and ethereal quality -- all given a lush and natural presence thanks to the Aida's expansive and accurate soundfield. A few particularly deep bass notes pushed the speakers toward some of the lowest frequencies of the demo, creating an intense yet balanced kick. Taken as a whole, the demo session did a good job of conveying the Aida's versatility and rich fidelity, highlighting the speaker's fairly neutral profile. Rather than overly favor either the highs or lows, the speakers offered an engaging mid-range that was able to gradually and smoothly expand to the extremes of both ends, seamlessly transitioning through a wide and dynamic range of frequencies without any harshness, distortion, or exaggerated brightness/booming. Every element of each track was given ample room to breathe, bringing out little details and nuances while maintaining an overall balanced quality that blended distinct instrumentals, vocals, highs, mids, and lows into an impressively cohesive sound. Likewise, the vibration reduction features actually seemed to work quite well, as the speakers were able to render deep low frequencies without any unwanted rattling in the relatively small listening environment. Though the neutral sound didn't always have the punchiness that some might prefer, at their best, the Aidas often had the effect of transporting the listener right into a recording studio or a club, creating a startlingly intimate quality that made it seem like an actual band was only a few feet away. In fact, the level of audio detail was so impressive that I almost didn't recognize some of the demo tracks when I went to listen to them again on my own budget-level headphones and speakers at home. Without the Aida's expansive presentation, they just didn't sound the same. With the new updated Aida speakers, Sonus faber has taken everything it's learned about audio design over the last few years and put it to the test, creating a truly premium listening experience with a beautiful external aesthetic. In other words, these things sound just as elegant as they look. Or is it, they look just as elegant as they sound? Either way, the results are genuinely impressive. 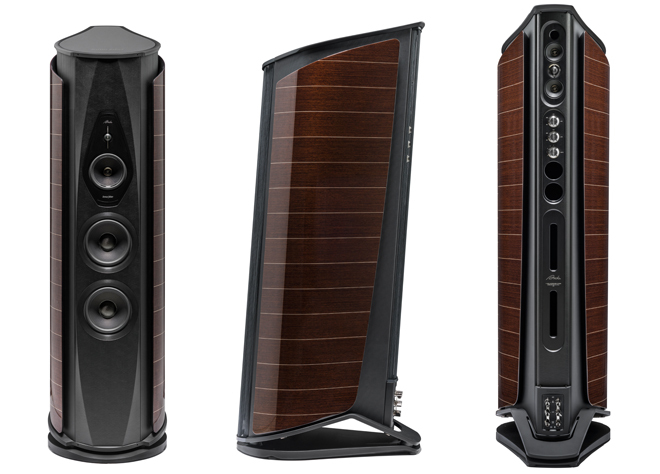 The new Aida speakers are now available in the US, Europe, and Australia for an MSRP of $130,000 per pair. And while a product that expensive is only going to appeal to a limited selection of wealthy audiophiles, based on my brief demo, those with pockets deep enough to make the investment should get their money's worth. Sure, spending over 100 grand on speakers might seem excessive, but when the results are almost as good as having a live band on call 24/7 in your living room, that cost starts to seem a little more reasonable.